We had the most glorious weather this past weekend, sunshine and warm in the 80’s! Friday was also a beautiful day, but I was stuck at work, so come Saturday morning I couldn’t sleep in, I had to get up and get outside. First I set untangled some electronet fencing and set that up out in my side yard/garden area where there is already some green grass coming in. When I brought the goats out they were so excited they were literally doing a jig, tails wagging like crazy, it was total joy. I sat and watched them cavorting around while I sipped my coffee and read a bit of the paper. Once caffeinated, I decided it was the right day to clear out and prep our lower barn for the goats. They spent the winter up in the barn that is close to the house, it’s right on the road, so it’s easy for hauling water, and I can hear them from the house if something goes wonky. Also, being new to goats, and a bit of a worrier, I wanted them close to me. But, since it’s right on the road, they don’t have free access to the outside. They have to wait for me to come and get them and lead them out to their paddock, when the snow was on the ground they wouldn’t go out anyway. Now that spring is upon us so early, I was feeling really guilty that they couldn’t come and go at will, and decided to change that. So, I moved all the stuff that was being stored in the little lower barn out and found new homes for it. It was stuff like old kerosene heaters, sugaring supplies, random tools and folding tables. There was a lot of it too. 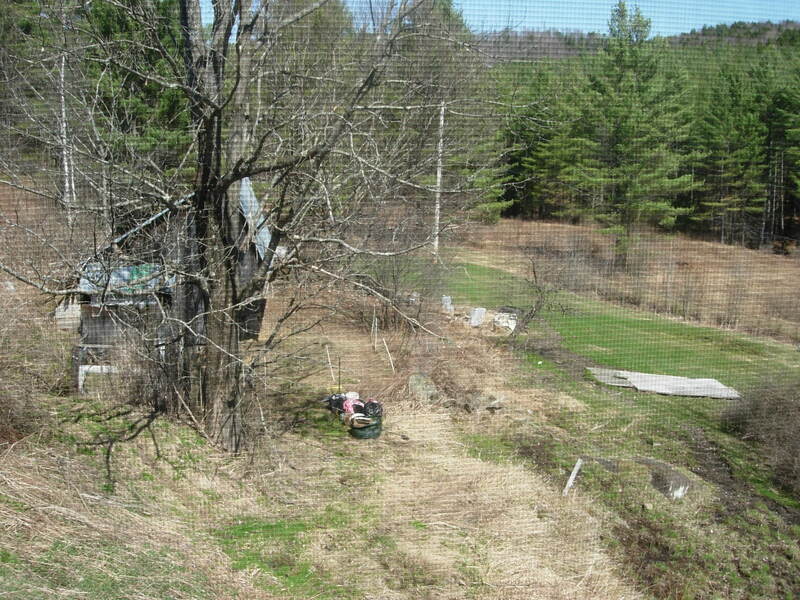 We call it the lower barn because it’s down the bank behind the barn at the road/house/street level. So, it’s up and down the hill a billion times to move stuff out, and haul stuff down. First I had to get out the loppers and cut back all the brambles and grapevine that grow behind the upper barn and make the path to the lower barn impassable. 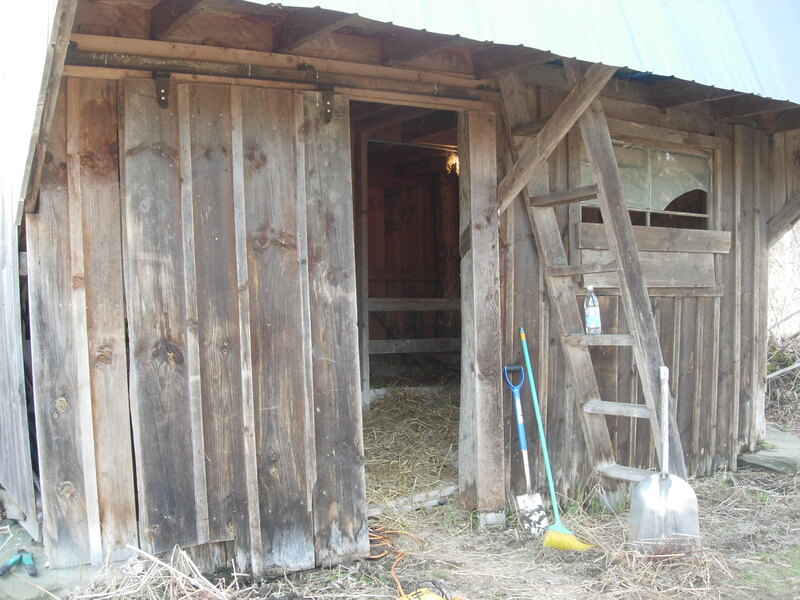 Then I cleared out the barn, shoveled out all the (very) old hay etc. and swept it clean. I put out some fresh hay, installed their loose mineral trays, water buckets and holders, and fancy hay feeders (old milk crates). There’s an old fridge in there that we use for our annual Memorial Day MudFest, which I couldn’t move, so I rigged up a divider to keep the goats away from that, giving me a little storage area for their grain bin/extra hay, treats etc. This lower barn even has a derelict window, which I’ll fix up later this week from my stash of old windows in the basement. I plan to erect a permanent paddock area around this barn, but didn’t have time this weekend. I spent hours removing the burdock plants and seed pods from the area around the barn, so that my goat friends wouldn’t have them tangled endlessly in their coats. There are a couple of areas of our property that are burdock ridden, and this is one of them. 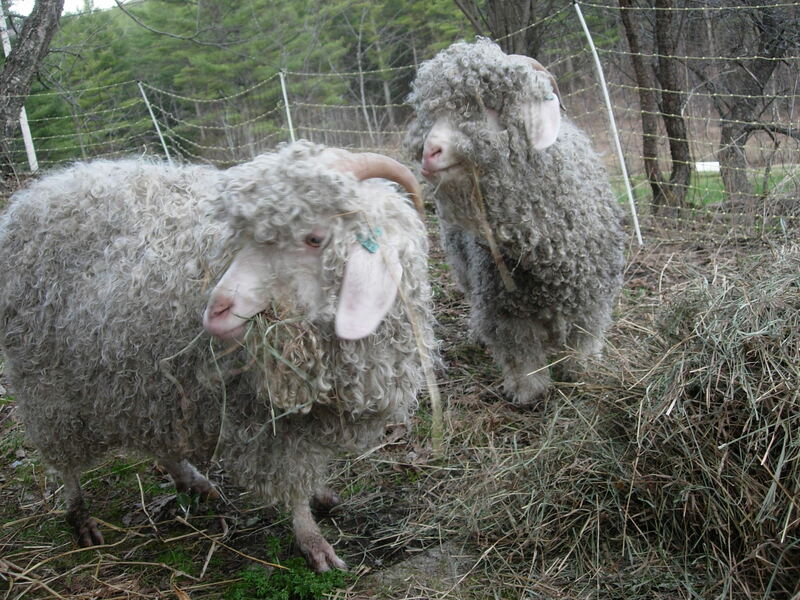 I’m hopeful that the goats will keep them at bay, I’ve heard that they like the fresh leaves when they start growing. 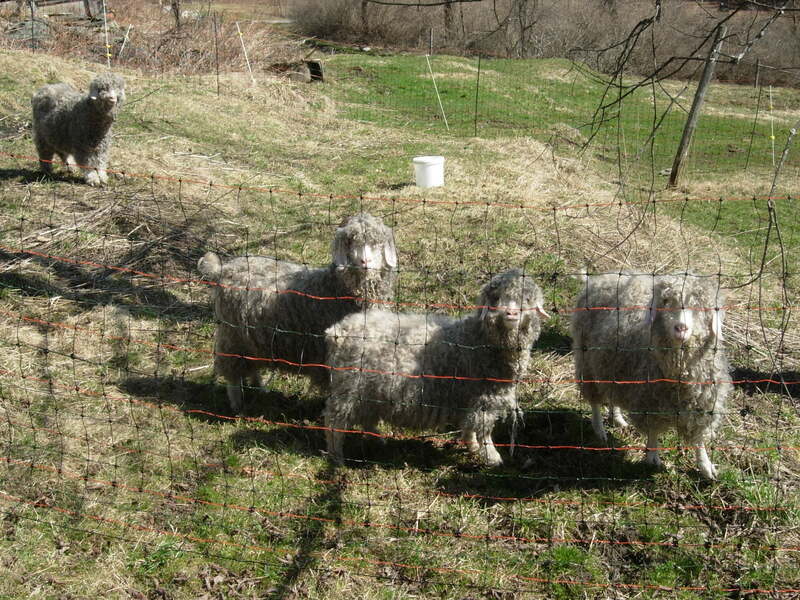 So for a few days they just have electric net fencing forming their paddock, but they are so, so happy out there now. I can’t tell you how much it has helped my hurting heart to give the goats this little spring gift, watching them cavort around, checking out their new digs was just what I needed. It’s hard to be depressed when these guys are exhibiting such joyfulness. I am still sad and missing little Pedey, but doing my best for the rest of the herd is very healing. I wish Tallula would let me cut her bangs, she can hardly see. I’ll be getting my shearing lessons from my neighbor in 2 weeks! I’ll help him shear his sheep the weekend fo the 17th and then decide if I think I can shear the goats myself. If I don’t feel up to it, I’ll hire my neighbor to come down and do it, he’s got 20+ years of experience at it. 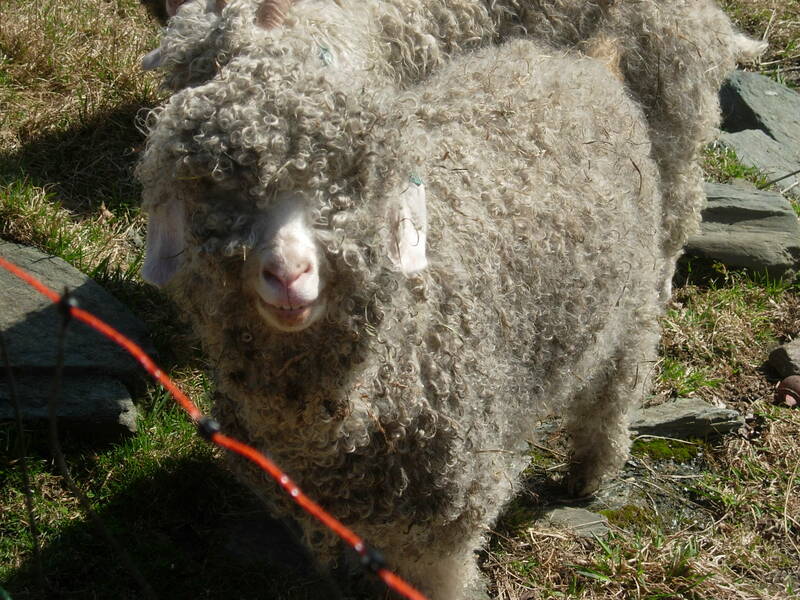 So, shearing should be happening by the end of the month. I’ll keep y’all posted. Again, thank you so much for all your thoughtful comments over the last week. It was a tough week and every kind word was treasure.